Instead of going for black crackle over yesterdays pink, I decided to give the gold another try and let it redeem itself, and I'm glad I did! 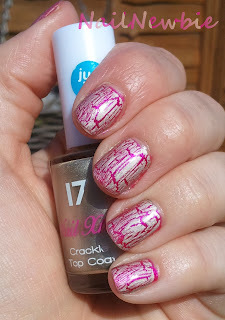 I was disappointed in the gold crackle from 17 before, as it didn't seem to crack very much and even over dark colours looked a bit, well, rubbish. 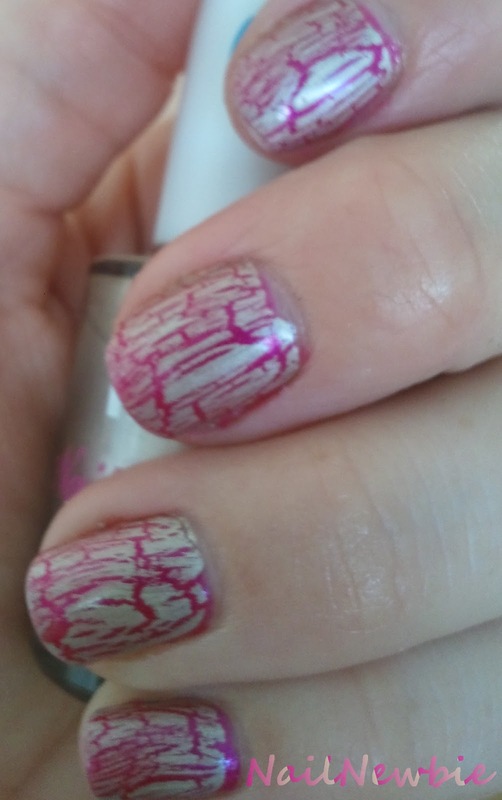 But over this pink it looks amazing, still didn't crack as much as the Barry M ones (in fact on the right hand where I am not so skilled and applied a slightly thicker coat, the cracks are bigger so that may be the key), but I love the effect I got. That's the best example of the 17 I've seen. I'll have another go with it and see if it crackles properly like it has for you. Very nice combination . I like the gold crackle a lot . I'm so jealous you managed to get it to crack so much!